Growth in the last Quarter was only 4 %……….The total for the full year will be pushing to reach even that………I am glad Sir, …… At least you have finally realized the Bull Dust Economics of these Yahapalana crooks , who treat the Srilnakan inhabitants as idiots……………Please don’t get me wrong… ….. I am not talking about the followers of Dr Ranil, Dr Harsha, and their Economics Whizz Kid Brigade………. 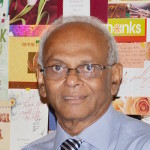 Dr. Wije: under Bondscam Ranil Wickramasinghe’s ‘good governance’, Lanka is now the American States of Sri Lanka! Who drafted the Vision 2025 document?! Washington Economic Hitmen. It has lots of spin and jargon but no road map or benchmarks. Fact is,Sri Lanka is in an being pushed deem into a Debt Trap and what the Amsterdam based Transnational Institute has termed the permanent “Bail out business”, whereby national policies of highly indebted countries are set by international accounting firms (Deloitt, KPMG, etc) banks and agencies like the IMF and so-called “aid donors’ to the detriment of working masses in debtor countries, rendering Economic Inequality out of control and making countries vulnerable to violence and conflict.. as in Greece. True Dude. Vision 2025 is to impoverish the SL nation and enrich Global 1 percent, via deregulation and privatization – a recipe for disaster in the context of institutionalized corruption and political rent-seeking. Di-Vision 2025 gives fictitious “growth constraints analysis” and FDI projections to encourage more Borrowing and Debt, like for the Central Highway in the name of fake “economic growth”, mainly to fund Ranil’s next election. The real reason for lack of FDI to Lanka is the culture of corruption, rotten governance and impunity that is the reason for “policy instability”. The Bond Gate inquiry means no more looting of CB. Make no mistake Ranil is the Economic Hitman of Trump-land! where did ‘Vision 2025’ come from? Who are the authors? Was there consultation of PEOPLE and local, provincial, and district authorities on local and regional development priorities? The economic development model in Vision 2025 lacks a human, social and environmental dimension and Safeguards analysis. To talk of economic growth and development without attention to social and environmental aspects and impact is in fact to invite “Development Disasters (financial, social and environmental) such as the Uma Oya Project or the Chinese-sponsored Hambantota White elephants now being sold off to the highest foreign bidder to further their strategic security interests. Today Sri Lanka is a debt-ridden Disaster, ironically in the name of Economic Growth and Development (grand rhetoric to distract people from the looting of national land and assets)- with lots of corruption projects like the Central Highway. Lanka is being turned into a concrete highway for Japanese, US and European luxury cars at the expense of agricultural land, farmer livelihood and food security. Lanka urgently needs a bottom-up growth model that is realistic, generates decent jobs in the real economy, rather than top-down spin to and policies to benefit JLL and other global real estate firms trying to capture land cheap. Right to Information should be used to find out who drafted RW’s “Vision 2025.” The pseudo-analysis is beyond Charita Ratwatta and Mangala Yapa. So, who is behind the hot-air fake-development policies for impoverishment of local communities and benefit of global 1 percent? So, Mahinda Rajapaksa, MAHA RAJA, and his policies seem to be behind every ailment. MaRa MaRa ChaTu MaRa Amaa MaRa…. The Minister of Fiance was busy with his Penthouse rental and acquisition plans. So, not all the ducks are not in a row for the Yahapalanaya “Team”. The pickings are slim when the national average IQ is 79. It looks you are advertising something for horapalanaya. How do you justify what you do, when that same person could look after the Central Bank for 100 days, Rats hired by he himself robbed it ?. Why don’t you accept that he is a failure ? Elect a set of known crooks and expect them to come up with a concrete plan for development, they have come up with a concrete plan for making commissions. First and foremost, think of creating a system of governance where one could replace the political administrators of the country at any given time, when they need be replaced for corruption or inefficiency and then we can think of developing the country. 1. deregulation and privatization of national data and information systems so that Big Data on Lanka is accessible to the Trump deep state. 2. deregulation and undermining of SL national oversight and regulatory bodies such as Central Bank, as was the case, with the ICTA national payment platform scandal. 4. Biometric ID cards to create a super security state that violates Lanka citizen’s privacy for deep data mining. India Supreme Court Ruled with full a 9 judge bench in New Delhi 2 weeks ago ruled that a similar proposed Adhar card violates, Right to Privacy, which it deemed a Fundamental Right along with the right to life and liberty. 5. Highways and transport sector sold off to Trumpland related, Japanese, Korean and Indian firms. 1. Sri Lanka clearly needs a transparent International Aid management system to coordinate and track foreign funds, both loan and grants, and, monitor and evaluate projects, also in line with the Paris Declaration of Aid effectiveness. 2. Lanka needs a national planning commission and an integrated national development plan with a road map for implementation of priority projects. 3. The single biggest reason for the debt trap is Corruption conducted in the name of “economic growth and development”. Addressing corruption and ensuring proper targeting and utilization of funds should should be the first, second, and third priority of the useless Vision 2025. But rather, it seem that if Vision 2025’s Land Bank is implemented in the current context of massive political rent-seeking and corruption, it will actually promote more corruption such as the take over of land into a land bank to be transferred to cronies, to be flipped to other interest – all in the name of using unused land for agriculture. IT is not Trump IT is just multinational corporations and some affiliated with the church. Trump is supportive of that promotes “America first”. One well known corporation is at the fore front. W.A. Wijewardena has taken this “Vision 2025: Need For Moving From A Wish List To A Concrete Plan” seriously. Most Lankans do not. Vision 2025 is nothing more than a “feel good” tool. The majority of Lankans do not take home $4000/- pa. But $40 000/- is not uncommon and $400 000/- exist. This discrepancy is due to CORRUPTION. Vison 2025 does not mention eradication of corruption at all. Sorry Sir, I will hold on to my wish list of corruption eradication. The economic policies of UNP regime has so many versions only in paper marked. We are far more integrated into more complex manner of economic and technology on going shifting Global development has emerging nations..
“THE POWER TO BECOME HABITUATED TO HIS SURROUNDING IS A MARKED CHARACTERSITIC OF MANKIND.VERY FEW OF US REALIZE WITH CONVICTION THE INTENSELY UNUSUAL,UNSTABLE,COMPLICATED,UNREBIABLE ,TEMPORARY OF THE ECONOMIC ORGINIZATION BY WHICH WESTERN EUROPE HAS LIVED FOR THE LAST HALF CENTURY. WE ASSUM SOME OF MOST PECULIAR AND TEMPOARY OF OUR LATE ADVANTAGE AS NATURAL, PERMANENT AND TO BE DEPEND ON AND WE LAY OUR PLANS ACCORDINLY.”( Economic consequences of the Peace) By Keynes. Unless the two coalition partners agree on a common economic plan we cannot proceed further. The state run enterprise lead development has been buried deep years back China and India joining. The sooner SLFP realizes that govt. cannot manage business and bury such policies will be better for us. Although Ranil has a clear vision for us his hands are tied. If not for Bandaranaike policies Srilanka would have been a Singapore by now. “Ranil has clear vision but his hands are tied”…Sri lanka would have been Singapore” .Is that the clear vision of Development of Capitalism in an Island Sri lanka? The story of Sri Lankan democracy of the capitalism of Parliamentary path in any place at any time have this common citizens feel they understand the governances mechanism of their rights of society. This sense of understanding of majority that implies that each of citizens have to have the self-confidences to wish to change our system of democratic society for the better. That was promised has given 2015 January for ” Good Governances and Rule of law” by MS, CBK and UNP-Ranil Wicks. They offers accepts by People’s majority of 6.2 Millions voters converted into mandate? The being Singhopareen is peculiar Capitalism without Democracy of ‘No Man Island’. It was Island converted in land for the Business. It is not model of democracy or civilization of world heritage ? I assume last week elected President of Singhopareen without any Election that against so-called Constitution of Singapore .? We cannot follow Singapore the blind path of Development ad Democracy! To believe in the development of economic reality of choice one of most basic characteristics of Ruling classes parties ,Political programmed, Policies of leadership are fundaments of democracy. .
Do all of us have such that self-confidence of UNP Leadership of Ranil Wicks of those basics? Do we have in his 40 years UNP’s in-services by of Ranil Wicks of unknown Economic vision ? The crux of an issues of Social Market Economy that by UNP party manifesto has keep high hopes of future that New era of democratic and entrepreneur network and relationship of production and services in which resources flow and shared by majority people of Sri Lankan? It will give New Rules and Practices to Democratic norms may be which avoid Neo-colonialism to intent to shifted to progress to Capitalism? or Sustainability of Development…..Capitalism? Our Economy is that social capital access to entrepreneurship and commodity chains dominated by Multi-national Corporations (MNC) and other supported by Financial Institutional of IMF, World Bank ADB and China. They having high hand. As other Rich countries and capitol actors gain grater ACESS to CAPITAL in market economy and CYBERSPACE not that influence by state of Sri lanka? We have been shut-out from the market economy of Rich nations and Cyber community? The capital formation of Social Capital is not easy path in between Capitalism and Communism? This is that UNP’s Economic saga of dreamed of Political to be ride toward unknown destination or directions of tiny Island of Sri lanak by insignificance policies are effects to country future UNP think-tank?